The real Florida #2 – Blue Springs State Park, a manatee refuge | can i just finish my waffle? The manatee seeking warmer waters in the winter made me think of the many less known and beautiful spots in Florida. Manatee Springs, featured in my previous post, runs into the Suwannee River which empties into the Gulf of Mexico. Blue Spring runs into the St. Johns River (a rare river that runs north) and empties into the Atlantic just south of Jacksonville. Blue Spring State Park is a designated manatee refuge. Spring water is so clear you can easily see to the bottom. But warm? It may be warm to manatees, but it is the coldest water ever to swim in, like jumping in ice water. The video at the bottom shows good pictures of the manatee swimming, and a gator or two. With the onset of cooler weather and lower water temperatures in the St Johns River; manatee sightings in and around Blue Spring should be increasing. As river temperatures drop below 68o, park visitors will be able to see manatees frequenting the Blue Spring run on almost a daily basis to stay warm. 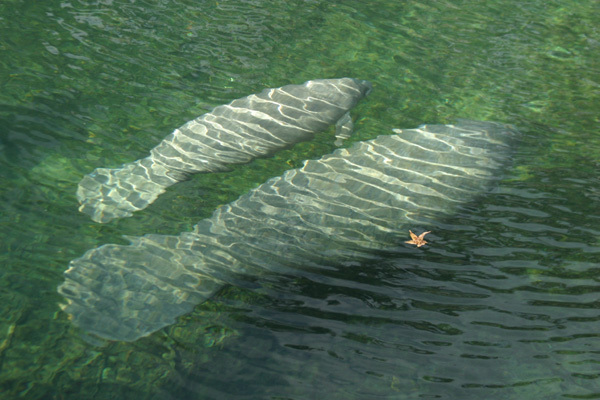 Temperatures in the spring run remain a constant 72 degrees; creating a warm water refuge for the West Indian Manatee. The best time to view manatees is early in the morning on a cold winter day. 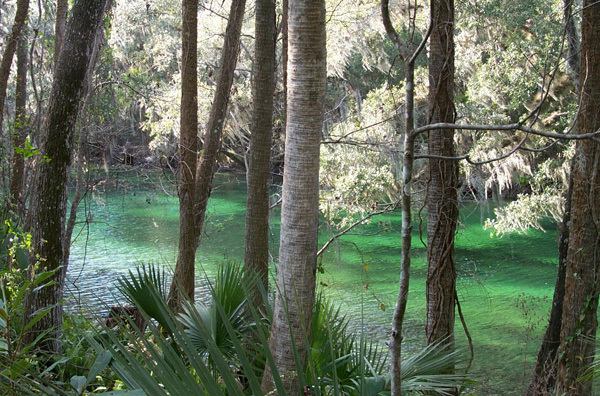 Blue Springs State Park is a picturesque getaway along the St. Johns River near Orange City in central Florida. Winter home to numerous endangered manatees, Blue Springs is 2,644 acres of natural Florida. Please remember if you plan a trip to Blue Spring to arrive early as the park often reaches capacity on weekends, holidays and during Manatee Season and will close temporarily until overcrowded conditions ease.